I love the idea of Tiramisu – the lady fingers, the mascarpone – I just don’t want to include the coffee or the alcohol. 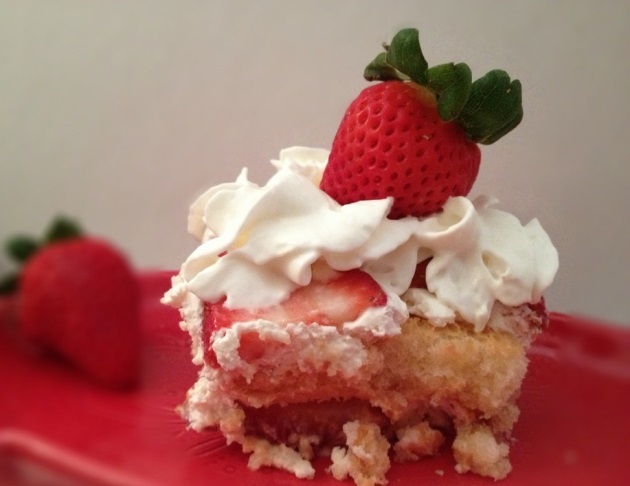 Then I came across this fabulous Strawberry Tiramisu recipe from Cream Puffs in Venice. Instead of using chocolate and coffee for flavoring, this recipe relies on Strawberries and jam. Included are a dash of lemon and orange flavorings as well. While this recipe calls for using Grand Marnier, I have substituted fruit juice instead. You must refrigerate this dessert for at least 24 hours before serving. If you don’t want such a big batch (it is served in a 9×13 pan), try halfing the recipe and serve in a 8×8 pan. This recipe was a bit hit at our Easter dinner! The Strawberry Tiramisu does need to be refrigerated, so keep that in mind when bringing to a gathering. Tiramisu using Strawberries and jam. Non-alcoholic. In a small bowl, mix together the jam, water, orange juice and ⅛ cup of the orange/tangerine juice. In a second bowl, mix together the mascarpone and the ⅛ cup of the orange/tangerine juice. In a third bowl, add the whipping cream, sugar and vanilla and 1 tablespoon of the orange/tangerine juice. Beat with an electric mixer until stiff peaks form. Add ½ cup of the whipping cream mixture to the mascarpone and stir well. Then, gently fold in the remaining whipping cream mixture into the mascarpone. Take the jam mixture and spread ½ of the mixture into the bottom of a 13 x 9-inch baking dish. Sprinkle 1 tablespoon of the lemon zest over the jam mixture. I actually zested the lemon right over the jam mixture. Take your ladyfingers and place them flat and close together in the dish. Make sure to fill every spot by breaking them if necessary. Spread one half of the mascarpone mixture over the ladyfingers. Make sure to cover the ladyfingers completely. Layer half of the sliced strawberries over the mascarpone mixture. Spread the remaining jam mixture over the strawberries and add the lemon zest as before. Again, layer the ladyfingers on top of the jam and fill every space. Spread the remaining mascarpone over the ladyfingers covering completely. Add the remaining strawberries on top of the mascarpone layer. Cover with plastic wrap and refrigerate for a minimum of 24 hours. Cecile, who loves to create, learn and explore, blogs at The Shopping Duck.